Horizon 2020 thematic networks work on a specific theme. They bring people from both science and practice together to create useful, practical outputs. Thematic networks are funded through Horizon 2020 which is the European Commission’s main 2014-2020 funding programme for research and innovation. Thematic networks have two main aims: collecting existing scientific knowledge and best practices which are close to being put into practice, but not yet sufficiently ready for farmers and foresters to implement; translating this knowledge into easily understandable end-user material such as short, informative recommendations and solutions (“practice abstracts”), leaflets, guidelines and audio-visual material (photos, video clips, etc.). 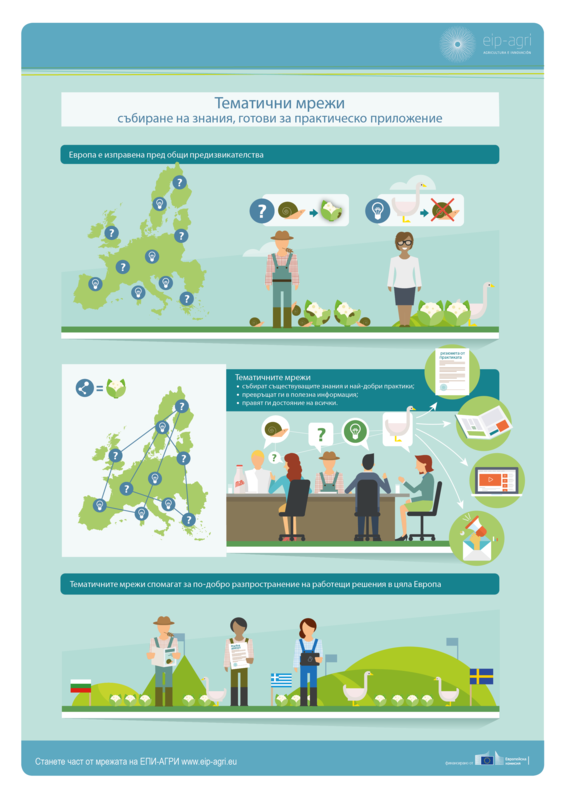 This material should be made available beyond the lifespan of the project through the main existing dissemination channels which farmers often use, as well as through the EIP-AGRI website: www.eip-agri.eu. French translation courtesy of Réseau Rural National Français. Hungarian translation courtesy of Földművelésügyi Minisztérium (Ministry of Agriculture of Hungary). Spanish translation courtesy of RRN (Red Rural Nacional).